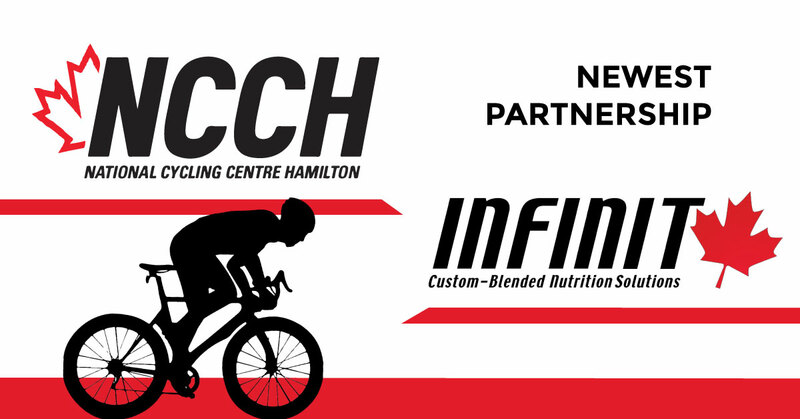 Windsor, Ontario, Canada: Infinit Nutrition Canada is a leader in ultra-premium custom-blended nutritional sports drinks and is announcing their newest partnership with The National Cycling Centre of Hamilton. Infinit Nutrition Canada will be fuelling the cyclists from The National Cycling Centre of Hamilton with their Race Fuel sports drink products throughout the year. “Infinit Nutrition Canada is thrilled to support the great work NCCH is doing in the world of cycling. NCCH and Infinit strive for the same things - helping cyclists of any level, from beginner to the most competitive athletes reach their full potential. We are happy to be a part of growing the Canadian cycling community through this partnership. – Darcy Haggith, CEO of Infinit Nutrition Canada. “NCCH & X-Speed United is extremely pleased to partner with INFINIT Nutrition, a Canadian company. Our Development team - NCCH pb Franklin Templeton Investments feeds into NCCH pb MGCC Trade Team, which then feeds into X-Speed United Continental. All of our athletes will have access to INFINIT Nutrition products and advice. It is our aim to have all levels of our organization exposed to the same sponsor products, and services. It just adds value to NCCH and the sponsors reach. " – Rick Lee, Manager of NCCH. The National Cycling Centre Hamilton is a not-for-profit corporation and was created as a legacy organization following the very successful 2003 UCI World Road Cycling Championships in Hamilton Ontario. We hold together with full-time and part-time staff, as well as many wonderful, helpful volunteers. Our Centre is one of five nationally recognized cycling centres in Canada and is responsible for identifying, recruiting, testing, coaching and training high performance and development athletes in the Province of Ontario. The Centre is formally partnered with the Canadian Cycling Association, the Ontario Cycling Association, the City of Hamilton and McMaster University. Since its creation in 2005, the Centre has assisted over 75 athletes win medals at National Championships and/or become members of the Canadian National Cycling Team. For more information visit http://ncch.ca. Infinit Nutrition Canada is proud to fuel Canada's most elite athletes, recreational athletes and weekend warriors with the highest grade, ultra-premium nutritional sports drinks. Nearly all sourced materials are from Canada and manufactured proudly in Windsor, Ontario, Canada. Infinit Nutrition is proud to fuel the most elite athletes, recreational athletes, and weekend warriors, through the understanding of individual needs and by providing the purest nutritional sports drinks to fuel them. For more information, visit www.infinitnutrition.ca or contact Infinit Nutrition Canada directly at 1-877-691-3835 or by email at cs@infinitnutrition.ca.